This is one of the largest skippers found in the upper Midwest. 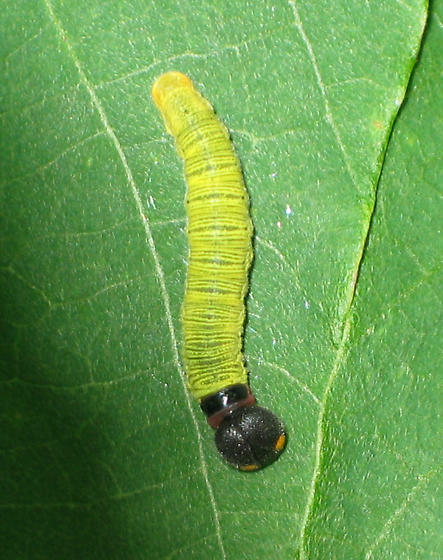 It is just over 1 inch in length with dark brown coloring, a gold band on the forewings, and a white spot on the hindwings that "flashes as it flies". 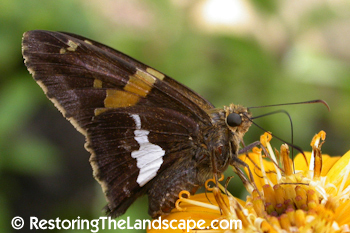 Silver Spotted Skippers are common garden butterflies, nectaring on a variety of plants. When we lived in the mid-Atlantic region, it was the most common butterfly we would see. Here in Minnesota, I have seen it less frequently. 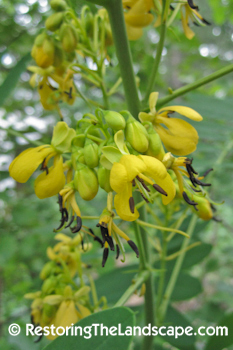 The major native foodplants are Cassia (Chamaecrista), Amorpha, Apios, Locust and other legumes. Silver Spotted Skipper is by no means a specialist but I will highlight the top three plants listed. This lacy annual legume is a great native for sunny, dry locations. We planted Partridge Pea a couple of years ago and it reseeds a few plants each year. 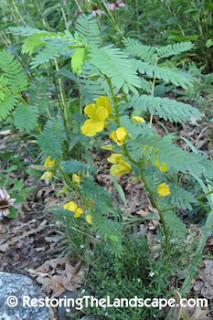 Partridge Pea flowers from mid July through September. It can reach 30 inches in height. The seed is produced in long pods and once dry the pods explode and shoot the seed several feet from the parent plant. It is native to the eastern US, from Minnesota southwards to Texas and east. This is a perennial legume, with similar yellow flowers to the Partridge Pea except that the anthers are dark brown instead of red as in the Partridge Pea. It prefers a full sun location. It is much taller than the Partridge Pea, reaching heights of 5 feet or more in rich soil. It flowers in late July/early August in Minnesota and is a larval host to the Little Yellow butterfly as well as the Silver Spotted Skipper. It's native from Ontario south to Georgia and eastwards. 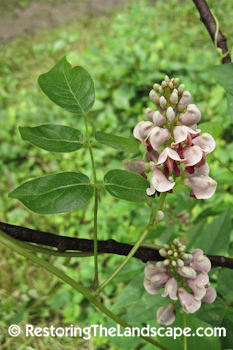 False Wild Indigo is a woody native prairie plant. It grows to about 24 inches in height, often the long woody stems are bare with the compound leaves in the top third. It's found in mesic to moist sites, in prairies in full sun. The dark grape colored flowers emerge in early June and continue to flower through the month. It's native range is from Manitoba southwards into the Dakotas, Minnesota, Kansas, Nebraska, Oklahoma and parts of Colorado and New Mexico. Read an early post about the Eight Spotted Forester Moth nectaring on this plant. 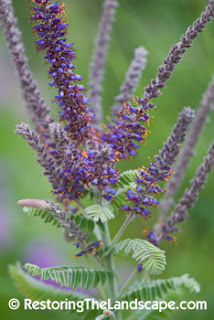 Lead plant is much more common than the Dwarf False Indigo. Similar in appearance except the compound leaves are a very attractive silvery gray in color. It spreads by suckering, forming a large clump in its prairie habitat. Lead plant flowers from late June into August. It thrives in full sun locations in dry to mesic soil. "Lead plant is relatively long-lived and generally slow growing. It is also very drought resistant and well adapted to repeated and frequent wildfire." (Trees and Shrubs of Minnesota) Its native range is the middle of North America, from Montana southwards to New Mexico, the eastern edge is Ontario south to Louisiana. Another native Amorpha in our area is Amorpha fruticosa, a tall shrub found at the edges of lakes, wetlands and riparian habitats. Ground Nut is a twining native perennial vine. Its habitat is usually adjacent to wetlands and riparian areas in partially shaded locations. It will climb up large shrubs or small trees. I have seen it on Prickly Ash as well as Nannyberry Viburnum. The flowers can be light pink to a dark maroon in color resembling an irregular pea flower and emerge in early August. 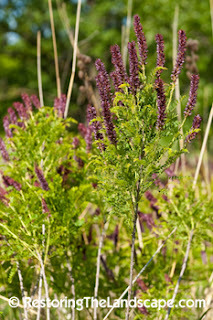 As the common name suggests, the rhizomes of this plant were extensively eaten by Native Americans who introduced the plant to early European settlers. (USDA Plant Guide for Ground Nut) Ground Nut is native to eastern North America from the Dakotas south to Texas and eastwards. Read an earlier post about this vine.